Created in 1981, Bourse de l’Immobilier is a specialist French real estate group. Within 30 years, it has become the leading network of independent Real Estate agents in France. With almost 300 agencies based in 10 regions and 30 departments, Bourse de l’Immobilier is satisfying over 15,000 customers each year with one motto: “effectiveness without boundaries”. The company employs over 1,000 employees, all fully qualified, experienced and focussed on customer satisfaction. The leading network of independent French real estate agents, Bourse de l’Immobilier is specialised in purchases, sales and lettings. Honesty, ethics and transparency are values shared by all the Bourse de l’Immobilier agents. Bourse de l’Immobilier can also provide exclusive services to buyers: Bourse de l’Immobilier offers 3 year resale insurance in case a property unexpectedly needs to be resold due to divorce, death, redundancy or multiple births. It insures the seller up to 35 000 euros in case of price depreciation. Always looking to the future, Bourse de l’Immobilier launched in 2012 an application available on App Store, Google Play and Market Place. 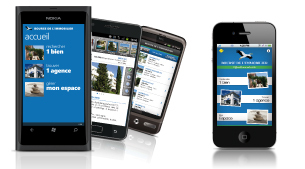 This application offers you to find a property, an agency, and to stay in touch with the latest property updates. However, Bourse de l’Immobilier does not neglect the traditional communication tools: over 150 000 copies of the Bourse de l’Immobilier 240-page catalogue are printed twice annually (spring-summer & autumn-winter).